Thanks to HIS for supplying us for review so many video cards over the years. Because of their great support of this site, we decided to buy HIS HD 5870s for our own personal systems when an upgrade was needed. Unlike most other HIS reviews on this site, we purchased this card for our own use. As a result, unlike other HIS video card reviews here, we will not only be providing our standard performance review, but also providing my personal experience with my first ATI card since arounce 2004/2005. We ran the benchmarks using a 64 bit version of Windows 7 Professional. Windows gave the 5870 a 7.8 rating in desktop and gaming graphics. The Windows ratings are not valid for comparison, but it\'s good to know. All of these benchmarks are run at 1920x1200 wide screen resolution. The Nvidia driver used is 195.62 and the ATI cards are using 9.12. These results were obtained using the performance test at the default resolution of 1280x1024. The 5870 surpasses everything else by almost 50%. The Unreal engine is known for its beauty and hunger for powerful video cards to run the latest games. For this benchmark we used UT3 version 2.1 (black edition). Sound and Direct X 10 were enabled. The 5870 beats even the SLI/CrossFire configurations of the other cards we have available. It is well beyond playable with an average of 166 frames per second. The Dunia engine is what powers the African based FarCry 2 game. The detail and explosion effects are amazing. This benchmark would not run with antialiasing or anisotropic filtering enabled. ATI cards seem to do well with this engine, and crossfire even more so. The 5870 is well ahead of all of the competition, except for the 4770 CrossFire, which is within 2 frames per second. This benchmark has antialiasing and anisotropic filtering set to 4X. The detail was set to High Quality and soft particles were disabled. I was surprised to see the SLI didn’t affect the performance at all. However, CrossFire really helped with 4770s, which take a distant second place to the 5870. This engine is older and all the cards get great results here. The HD 5870 is faster than even the oddly fast 4770. Maximum quality was used, motion blur and bilinear filtering was enabled, and antialiasing was disabled. We ran this benchmark with very high detail. The graphics in this game look amazing. The results listed below are somewhat misleading. The average frame leader is indeed the pair of 4770s, but the minimum frame rate was 11, with the 5870 scoring 27. The GTX 260 scores 13, and the 8800GT SLI scores 12. What does this mean? With a minimum frame rate near 30fps, the 5870 is the real winner, and watching the benchmark is almost cinematic in smoothness. The latest Crytek engine has been notorious for bring many systems down to their knees. These cards struggled. This benchmark was run under the Very High setting which is generally not recommended, but the HD 5870 performed admirably here. Perhaps we\'ve finally hit the performance level that is needed to really enjoy Crysis at these settings. As I described before, watching the benchmark run is nearly a cinematic experience. Dirt2 is one of the first games available offering Direct X 11 support. If your card does not support DirectX 11 the game reverts to DirectX9. All the results here are in Direct X 9 except for the ones labeled DX11, which include the HD 5570, 5750, and 5870. Each benchmark result is variable; for example your car can place differently each time. As a result, these results should not be considered without some skepticism, but they are good for getting a ballpark figure for performance. As the results below suggest, with all details at their maximums, it\'s extremely playable. In virtually every category, the HIS ATI Radeon HD 5870 is faster than any video card we\'ve ever been able to get our hands on. Or any combination of video cards. And it\'s not just in the maximum frame rates, either. It\'s where it counts – the game play experience is fantastic, with minimum frame rates that just won\'t budge. I didn\'t expect to be able to notice as much as I did from 8800GT SLI to this as much as I have. Part of this is 1GB of RAM vs. 512MB, but even still, it\'s a beast of a card. Though I do not have the ability to test noise level, it\'s remarkably quiet. I ended up replacing the stock heatsink on my first 8800GT because the stock fan is too loud. There is no such problem with this card, and that says a lot considering it\'s the fastest single GPU card money can buy. While we do not have the equipment necessary to test this, ATI\'s new cards support EyeFinity. With two DVI/HDMI ports and one DisplayPort monitor (or active adapter), you can display one game on up to three monitors per HD 5870. The immersiveness of playing a first person game with multiple screens covering your periphery is pretty appealing. While the game list that supports this is currently short, it is growing. And considering the power that these cards have, it\'s a great way to take advantage of it if you have the money and desk space to do so. As I mentioned before, this is the first ATI card that I have used full time since the 2004/2005 timeframe. I had an ATI Radeon 9800 at the time, and it was a great card to upgrade from my GeForce 4 Ti 4200 which I had before. I have generally had good experiences with that card in Windows, and games all ran fine. However, its Linux support was terrible to the point of almost unusable, so when NVIDIA came out with a superior product come upgrade time, I went to a NVIDIA GeForce 6800GS and never looked back. Since then, I\'ve had a 7900GS, and my two 8800GTs and had great luck with them all. The drivers are impeccable, and their Linux support is the best in the business, if you\'re willing to live with proprietary (non open source) drivers. Every 3D game that I\'ve ever owned, from the oldest games from the 1990s and early 2000s like Homeworld, Freespace 2, Descent 3, System Shock 2, and even real oldies like Wing Commander Prophecy could be gotten to work on NVIDIA. Though they have occasional hiccups, I\'ve been extremely pleased with NVIDIAs drivers. For older games I would just crank every setting (anti-aliasing (AA), transparency AA, 8x anisotropic filtering (AF)) and just enjoy my games. I would sometimes create a custom game profile so that I didn\'t have to make it override the settings of every game, just that one. Overall, it worked perfectly and without any more trouble than I would expect given my tweaking nature. And then came my brand new shiny HD 5870. I happened to get the new cards the very day that the Catalyst 10.2 drivers came out, so we loaded our brand new cards with the newest drivers, went into the Catalyst Control Center and enabled all the fancy new features like Edge detect AA, 8x+ AF, and the adaptive multisample AA that\'s supposed to behave similarly to NVIDIA\'s transparency anti-aliasing. Then I fire up my games. At first, things seem amazing. The frame rates are butter smooth, with performance to spare. Anything made in the last 2 years that I throw at it has performance to spare. Crysis is almost a religious experience (No one takes God\'s place, but playing Crysis on Very High was very moving). Amazing. I have modded Oblivion with many, many graphical enhancements. It happens to be the game that I am playing right now, and I had to turn some of the graphical mods off with my 8800GTs. Well with this card, I turn them all back up, and go crazy – I make the draw distance so far that I can see the trees on over half of Cyrodiil(the game world) and I still have fantastic frame rates. I am very pleased. As I visit Leyawiin(a town), I notice that some of the trees are glitched out. I\'m a bit surprised and disappointed, but I figure I\'ll test some more games. So I fire up the previous Elder Scrolls game, Morrowind. Huh? Missing mouse cursor, so the game is almost unplayable. And Star Wars: Knights of the Old Republic will not even start. I thought it might have been Windows 7, so I try XP with similar results. Huh? I thought Direct3D & OpenGL were backwards compatible? And, Prince of Persia PC has messed up graphics, and 4x4 Evo 2 (another oldie) won\'t start.. and so on it goes. So many older games just won\'t work. As you can imagine, I was getting pretty upset. I had lined up buyers for our old equipment and now I didn\'t know what to do. Sell it? Live with the fact that older games won\'t play? I\'m sure you can imagine my frustration. Well, after a week or so of irritation, I find some answers around the internet. AMD\'s drivers are known to have regressions between releases, but apparently that is doubly true with their OpenGL driver. I extract the atioglxx.dll driver from the Catalyst 10.1 driver, and Star Wars: Knights of the Old Republic and KotOR 2 both work with the older .dll in the game directory. That\'s a relief. As I explore more, and play with settings, I find the culprit – Adaptive Anti-Aliasing. It turns out that this feature is not well implemented, and once disabled, Oblivion\'s texture problems disappear, 4x4 Evo 2 starts up, Morrowind\'s mouse is back, and other problems are gone. Knowing this, I tried some more settings, and for Homeworld I had to disable anti-aliasing altogether to get that game, as well as Prince of Persia to work properly. Another quirk is that as long as Catalyst A.I. is on, despite driver settings, it will apply the game\'s anti-aliasing and anisotropic filtering settings even if they are hard coded in the control panel, so I had to change Prince of Persia\'s settings in game despite what the control panel said. After all of that worry, pain, and many hours of research, I finally have all of the games that I have tested working on my shiny new ATI 5870. Since ATI does not offer the really handy per-game profiles that NVIDIA does, you have to change it manually before playing another game. They do have setting profiles, but there is no way to tie them to game executables like NVIDIA. There is a third party application that can do this called ATI Tray Tools, and indeed, many don\'t even install ATI\'s Catalyst Control Center and use this instead. It\'s that good. But, the current version has a showstopper bug for me – the Steam overlay does not work. Until this is fixed, it\'s manual profile adjustment for me. Another odd problem is that the 2D performance is pretty terrible. While reviewing \'Keys of the Kingdom\' it was particularly noticable (and intolerable). While NVIDIA\'s 2D performance isn\'t spectacular, this is a case where 2D performance has regressed almost ten years. Tom\'s Hardware has an excellent series of articles detailing this, with part 1 here (link) and part 2 here (link). Fortunately, they know about the 2D performance issue and it should be fixed for either the Catalyst 10.3 or 10.4 release. What is the take away from all of this? With an NVIDIA card, it\'s almost game console like simplicity – set your options, play your games. With ATI, there is some definite tweaking involved for many less common games. While there is often a workaround, the fact that you have to work around problems at all is a real shame. AMD/ATI\'s hardware is fantastic. They now have to get their driver experience to the same level. The Linux support is miles ahead of the shambles that it was back when I had my 9800. Things seem to work for the most part, though still not with the performance of the NVIDIA drivers, using their proprietary fglrx driver. They release a new driver monthly along with Windows releases, and things are getting much better. On the other hand, they do not yet support the latest version of X.Org (7.5) and other little things like that. Since the acquisition by AMD, they have been delivering the specifications of the chip hardware to the open source community. As a result, as things get better, ATI users will no longer have to worry about drivers at all – they will be built into the kernel and X with all the latest features. Honestly, this was one reason I was willing to go ATI again. While the proprietary drivers are getting much better, the open source drivers will soon mean it doesn\'t matter. And while Windows is still necessary for most cutting edge gaming, Linux has a lot to offer and I still want a good experience there. 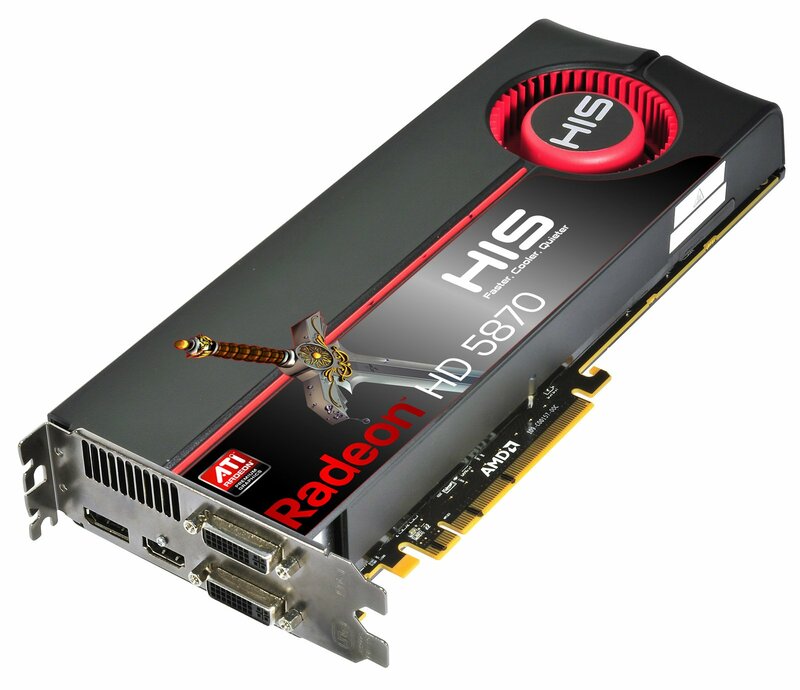 The HIS ATI Radeon HD 5870 is a fantastically performing card. While the price is certainly high at around $400 right now, that will no doubt go down as competition gets more fierce and time goes on. It can handle virtually all popular games out there and definitely is more powerful than similarly priced NVIDIA cards. If you plan on playing Crysis, this is your card. This is also an excellent choice for multimedia and HD movie watching, as it supports audio over HDMI. The built in HDMI port, as well as dual DVI and one DisplayPort plug are a nice addition. Eyefinity is also great if you want to game on multiple monitors. Dirt 2 comes bundled with this card, so you can enjoy DirectX 11 right away. It also includes a CrossFire adapter as well as 4-pin to PCI-E power adapters. There is a DVI-VGA adapter too. If you\'re looking for the fastest single GPU card on the market, this is it. Just expect that you may have the occasional driver bug until they get their act together on that front. Once they do, watch out – this is one fast card. And this HIS model is one I can recommended confidently.